NUTREN JUNIOR® FIBER-Complete Liquid Nutrition with Fiber. When a child can't consume adequate calories from regular foods, this whey protein-based pediatric formula with fiber provides complete nutrition to help support a healthy nutritional status. Contains a fiber blend to help support digestive health and normal bowel function. Oral\Tube. Help support gut health with a whey-based formula with PREBIO¹™ and fiber. Adequate nutrition is key to a child's growth and health. 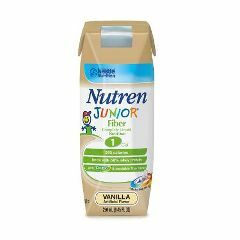 NUTREN JUNIOR® FIBER is a well-tolerated fiber-containing tube feeding formula or oral supplement that contains 50% whey protein to promote tolerance. Plus, its special blend of fiber supports digestive health and normal bowel function. Ingredients: Water, Maltodextrin, Sugar, Milk Protein Concentrate, Soybean Oil, Contains less than 2% of Whey Protein Concentrate, Canola Oil, Medium Chain Triglycerides (From Coconut and/or Palm Kernel Oil), Pea fiber (Insoluble Fiber), Artificial Flavor, Soy Lecithin, Calcium Citrate, Fructooligosaccharides (soluble fiber), Potassium Chloride, Sodium Phosphate, Inulin (Soluble Fiber from Chicory), Magnesium Phosphate, Potassium Phosphate, Choline Chloride, Sodium Ascorbate, Potassium Hydroxide, Salt, Carrageenan, Taurine, Alpha-Tocopheryl Acetate, M-Inositol, L-Carnitine, Ferrous Sulfate, Zinc Sulfate, Calcium Pantothenate, Niacinamide, Vitamin A Palmitate, Vitamin D3, Manganese Sulfate, Thiamine Mononitrate, Pyridoxine Hydrochloride, Riboflavin, Copper Sulfate, Beta Carotene, Folic Acid, Biotin, Potassium Iodide, Chromium Chloride, Sodium Molybdate, Sodium Selenate, Vitamin B12. Great price for Nutren Jr!! Wonderful Product - Toddler Loves It! Good Taste. Produces Results. Simple To Take. Former 27 weeker, now 2.5 yrs. This product helps him gain and maintain weight when he won't eat well. Can be given in a cup or bottle or added to milk. Tastes good and is gentle on his system. No side effects, his doctor recommended it and it works! Mother of preemie. Health Conscious. My ex-25 weeker loves it! Great taste and easy to drink! Works as a charm! I have to buy this product. Produces Results. Good Taste. Acts Quickly. Simple To Take. the product itself is good. My son has been taking it for 9 years. I used it with NG tube for my 1 year old and now he is 14 months and he drinks it with thickeners (he has dysphagia) with sippy cup. Fiber helps a lot as well. What is the difference between Nutren jr and pediasure?